I'm off to the NC mountains and away from internet access so you won't see a blog, link, photo or tweet from me for a couple of days. Have a nice weekend. Over and out. Vacation is over and it's back to work today. I rode the tram up to Amsterdam Central Station to see Andi off, checked out of our vacation hotel and made my way up to the Movenpick Hotel for ApacheCon EU. I'm in the ApacheCon hackathon room now working to clear my in-box, catch-up on blogs and figure out what work things need my (rather limited) attention this week. Vacation was wonderful, by the way. I didn't do any travel blogging on this trip, but I've taken about 200 photos and uploaded some of the best to my Flickr account. I took a bunch of nice shots of the Queens Day festivities yesterday. and the ad hoc boat parades. I've also been building a Google map of our travels, annotated with photos and comments. I'll share that link later this week once it's more complete. Andi and I are off to Amsterdam for a week of vacation and then I'll be staying for ApacheCon EU next week. I might do a little travel blogging like last year, but now I've got to run. It's time to get to the airport. The Smithsonian Air & Space Udvar-Hazy Center at Dulles airport is simply amazing. 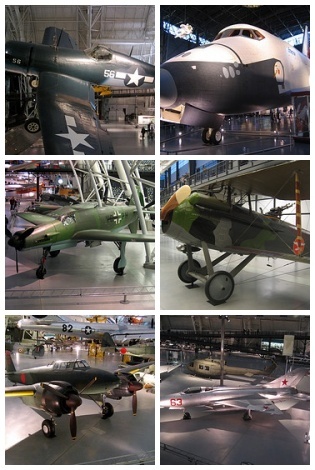 The center "provides enough space for the Smithsonian to display the thousands of aviation and sapce artifacts that cannot be exhibited on the National Mall." I could have spent a lot more time there, but not everybody in the family shares my fascination with air, space and military history. Here's a mosaic I created from some of the photos I uploaded to my Flickr account (I used Mosaic Maker to put this together). We opened presents in Chapel Hill on Xmas eve, at home in Raleigh on Xmas day and then drove up to Northern Virginia for one last round of paper ripping, twisty-tie unfastening and worship of the one deity that really matters to the kids: the good lord Lego. Lego ruled christmas here again and this year, for our kids the holy trinity is Lego, Star Wars and the Cars movie. Lego's hegemony over the Johnson playroom has some history. Long time readers may remember the Jack Stone incident. 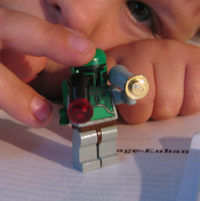 Jack Stone has been replaced by a series of increasingly complex Lego Star Wars vehicles for the older boys and an oddly intense Lego Boba and Jango Fett fetish on the part of our four year old. And Lego is also serving as a gateway-drug -- Alex (10) got Lego Mindstorms earlier this month and has been spending hours building bots and some pretty complex programs. I had to include the Cars movie in the holy trinity because Leo eats, sleeps and drinks it now. I'm almost too embarrassed to admit that he's got Cars movie plastic cars, die-cast metal cars, carrying case, models, pajamas, a blanket (known as fuzzy), socks, shoes, underwear and pull-ups -- but no Cars movie Legos (yet). I got a couple of nice gifts too. As usual my brother gave me some user-generated content; his year he put together a wonderful CD full of about 30 Who covers. I also got a couple of books: Innovation Happens Elsewhere and The Innovators Dilemma. We'll be in the Northern Virginia area for the next couple of days. After a short pilgrimage to the Lego store today we'll head over to the new Air & Space museum at Dulles airport. Tomorrow, we're expecting good weather so we'll head down to DC to check out the National Mall. Over the weekend, we drove about three hours west towards the mountains to Statesville, NC for the annual Carolina balloon-fest. We saw a tank, an assortment of military helicopters and we even saw some balloons attempt to inflate. Unfortunately, it was way too windy for ballooning. So it was a bit frustrating, but the kids love any chance to take a road trip so it wasn't a total loss. You can see some of my photos on Flickr. We're off on our annual weekend trip to the NC mountains and our friend's house overlooking the New River. In past years we've gone canoeing, hiking in the Grayson Highlands and picking lots of blackberries. This year we're going to bicycle down the Virginia Creeper Trail, which I've been told is 17 miles long, all downill and passes through some beautiful scenery. All in all it was a great trip. We spent seven nights in Ireland, stayed in six different towns and drove about 800 miles around the island. It was our first vacation away from the kids in about ten years and we really had a great time together exploring the country-side and towns in the west and south of Ireland. In case you're considering a trip there too, here are some observations and a list of our favorites experiences. Lodging. B&B's are numerous in Ireland, but we favored guest houses when we made our lodging plans. Looking back, our favorites were Davitt's guest house in Kenmare and the Buttermilk Lodge in Clifden. Food. We found lots of choices for food and we had indian, chinese, Irish contemporary and pub-grub. Our favorite meals were at Punjab Balti in Dublin, Davitt's restaurant in Kenmare, Laken House in Kilkenney and the Porterhouse in Dublin. Connnectivity. Mobile phone signal is strong all over the island -- four bars everywhere. Internet access can be found in post offices, coffee shops and other businesses. Wireless internet is a little difficult to find, but we found it at the video store in Clifden, a coffee shop in Galway and a computer store in Kenmare. Price was around four euro / hour. Prices. Food and fuel are pretty expensive in Ireland right -- and the USD to Euro exchange rate doesn't help. Renting a car is also very expensive, which must be due to the dangerous roads. And that's it for the vacation. Now, back to your regularly scheduled programming. Today (Thursday) we woke up early and got an early start. We drove north towards Dublin, took the scenic route through the Wicklow mountians and stopped at Glendalough, the beautiful double-lake valley where St. Kevin and his followers built a monastic city. We walked around the ruins, the lakes and up to the small waterfall there. Glendalough is only about an hour south of Dublin by car or tour bus, and it's worth the trip. Next, we stopped briefly at the seaside town of Bray before heading back to Dublin. Thursday was our list night in Ireland, so we stayed near the airport in a Eagan's guest hour. We didn't want to venture all the way downtown, so we ate at the Porterhouse restaurant just a couple of blocks away. Porterhouse is a micro-brewery with an awesome selection of beer, and a very interesting guide to beer on every table, and reasonably priced food. I didn't expect much from the place, but it turned to be one of the best dining experiences of the trip. When we arrived at the airport, we found chaos and another bomb-scare in progress. Somebody left a rucksack under a stairway in the arrivals area, so the authorities order an evacuation and called the bomb-squad. Our flights were delayed for a couple of hours, but we both made it home safely by the end of the day. Today (Wednesday) we got an early start, had an excellent breakfast at Davitt's and headed out from Kenmare towards Kilkenney. We didn't make any stops and the trip took about 3.5 hours. We spent the rest of the day exploring the town, doing a little shopping and taking a tour of the Kilkenney Castle, which was the home of the Butler family until 1935 when the family moved out, auctioned off the contents and left the castle to fall into complete disrepair. In the 1990's the castle was restored to it's Victorian-era state and much of the contents was returned to the castle. They did a great job and as a result the tour was excellent. Tonight we're staying at the Laken House, a restaurant and 10-room guest house across the river from the castle. The room is nice and our package-deal included dinner which was excellent, but the place is empty and the dead-quiet is a little disconcerting. Tomorrow we're off to Dublin for the last night. Finding internet access here in Ireland has been difficult and when I have been able to get online, I've had only enough time to upload photos, post a blog entry and correspond with the folks who are so kindly caring for the kids. With a couple of exceptions (e.g. Manning Press) I haven't had time to read or respond to my growing backlog of email. I'll be back online Sunday night, so you'll just have to wait until then. Cheers! Today (Tuesday) we explored the southern part of the Ring of Kerry, which is a 110-mile route that follows the coast of the Iveragh peninsula and was apparently carved into the seaside slopes by thousands of years of tour bus traffic. The mountain and coastal views are truly amazing, even on a grey and overcast day as we had today. Starting in Kenmare, we drove west and stopped in the small town of Sneem for a relaxing walk through the town's nature park along the river. We saw a pretty pair of swans there. Next we stopped at Staigue Fort, a well-preserved iron-age fortress -- really just a 15-foot tall circular stone wall -- about 4km off the main road between Sneem and Castlecove. It was an interesting sight, but the narrow one-lane road was a real problem. From there we drove on to Waterville, where we took another short walk by the ocean and then decided to turn around and backtrack our way home. On the way home we stopped at Derrynane House, the home of Daniel O'Connell who campaigned for and won equal rights for Catholics in Ireland. The house itself was not all that impressive, but the history lesson was very interesting and the park there was beautiful. We took a walk along the beaches to the ruins of the old abbey nearby. After that we made our way back to Kenmare to enjoy a nice dinner at Davitt's guest house (our second night in Kenmare). Tomorrow, we're off to Kilkenny. As usual, photos are on Flickr. On Monday morning we headed south again, driving through Kilarney and stopping to do some hiking around the lakes near the Muckross house. We took the tour of the house, which was quite interesting thanks in part to an entertaining tour guide. After that we made our way over the mountains, stopping at the Ladies View for a breather. The driving was quite nerve-wracking and frankly, we were thankful to make it to our next stop Kilmare alive. Driving on the left, swerving to avoid the big buses roaring around the narrow mountain road switch-backs and the faint smell of burning in the air really brought back some memories for us -- memories of our first year of marriage, which we spent in Jamaica. Did I mention that we're here to celebrate our 15th anniversary? We arrived at Kenmare, definitely a "cute" and colorful little town with nice restaurants and tourist oriented shops. Andi loves it. We checked into Davitts, a restaurant to guest house right in the middle of town, to find a modern, large and well decorated room. After we check-in via the internet tomorrow we'll explore Kerry and if the weather holds up we'll find another place to take a hike. We started off Sunday by driving Sky Road in Clifden, a 7-mile twisty and narrow loop road that runs to the north and west of town with wonderful views of the coast. It's called Sky Road for a reason and I've got a healthy fear-of-heights so I was a little nervous during parts of the drive, but it was worth the time and the nervous tension. On the road back to Galway the sun came out and it turned into a beautiful sunny day, quite different from the dark drizzly drive we had the day before. Once we reached Galway, it was quite hot. The streets were crowded with Sunday afternoon strollers and shoppers. We walked around the city center long enough to find a nice coffee shop called Mocha Beans with wireless internet (20-minute voucher w/purchase) and check-in with the kids and the folks taking care of the kids via email. From Galway we headed south, stopping to take the tour at Dungaire Castle along the way. The sunny weather held up and next we made the obligatory stop at the Cliffs of Moher and take the obligatory photo, but decided not to take the extended walk south along the cliffs -- it was starting to get late in the day. We drove through a series of interesting little towns south of the cliffs. We had to slow down in Miltown Malbay because the streets were filled with street vendors and revelers enjoying pints in the street on a sunday afternoon -- we're not really sure what was going on there, none of the other towns around were so active. When we finally arrived in Kilkee, the sun was still shining brightly and the beach was still full of sun and sea bathers. After the dark and dreary days in Dublin last week, I wasn't expecting this. We spent the remaining hours of sunlight exploring the town on foot and trying the relatively inexpensive Chinese restaurant on the main street. We stayed at the Halpern Hotel, which was a little disappointing. We were the only guests and the place seemed drab and charmless, especially after our pleasant experience at the Buttermilk Lodge the night before in Clifden. A friendly cat we met last night in the 10:30PM twilight (in Clifden). Andi arrived yesterday (Friday) and decided to forgo sleep and walk around Dublin while I attended the last day of ApacheCon. I was occupied until 6PM because I didn't want to miss Craig Russell's talk (excellent, BTW), one of the last talks of the day. After that, Andi joined me and some Sun and IBM folks from the Apache Derby dev team (Manyi, Olaf and Sateesh) for a very nice dinner, drinks and conversation ranging from religion and politics to open source dev processess. Making some new friends was a great way to end ApacheCon. Today, we drove across Ireland from Dublin to Clifden stopping in Athlone for a couple of hours of walking around and taking pictures. After a shaky start and almost getting lost in a maze of roundabouts outside of town, the trip went well. We had sunny weather most of the way and made the trip in about 7 hours total (including our stop in Athlone). After we passed Galway, we started to hit mist and rain but the scenery was fantastic, if a bit desolate and sheepy. Just as we were about to check into the Buttermilk Lodge the sun came out for a bit, which was encouraging. So now we're uploading photos and emailing the kids and getting ready to enjoy some music downtown. We'll check in again tomorrow if we can. Next stop is Kilkee. We just returned from a most excellent spring-break trip down to Georgia for some sight-seeing in Atlanta and a family re-union in Callaway Gardens. I had hoped to get some serious work done on my ROME chapter, which is due Wednesday, but that didn't work out so well. I did get some work done, but I'm definitely gonna blow my deadline. That's OK, I had fun instead. The kids did too. We did the new Georgia Aquarium, which was incredibly crowded but well worth the effort. The next day, the kids managed to sit still through the Cyclorama, which you'll find interesting even if you have only a passing interest in Civil War history. We also had a wonderful dinner at Mu Lan with my parents, thanks in part to little Leo, who slept right through dinner. Callaway Gardens was beautiful and the villa we picked was the perfect spot for a small family reunion and multi-birthday celebration -- we celebrated my dad's 70th, my grandmother's 90th birthday and others. We visited the butterfly house, the vegetable gardens and then I ducked out on the birds of prey show to get some work done. We also pored over a small mountain of unsorted memorabilia and most of the items pictured on this page about my great great great grandfather James Mason. Now it's back to the grind. The ROME chapter is a little more difficult that I had thought as I'm finding some deficiencies in ROME (some are my fault) and fighting an overwhelming urge to fix them or at least document them in depth.